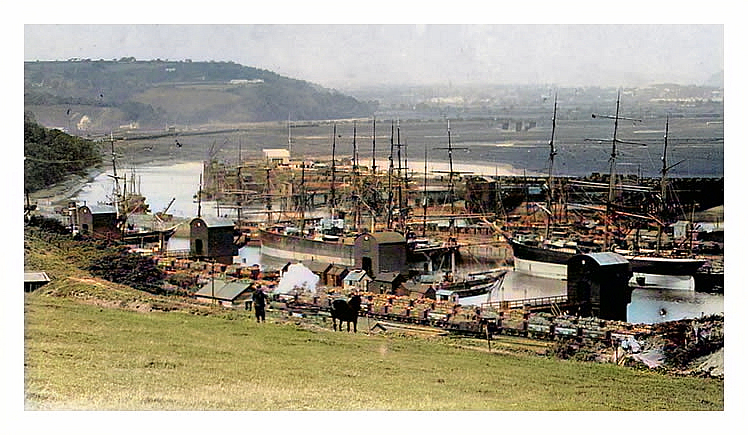 • 1889 - c.1891 - Penarth Dock. Depicts sailing ships, steamers, man with a pony. 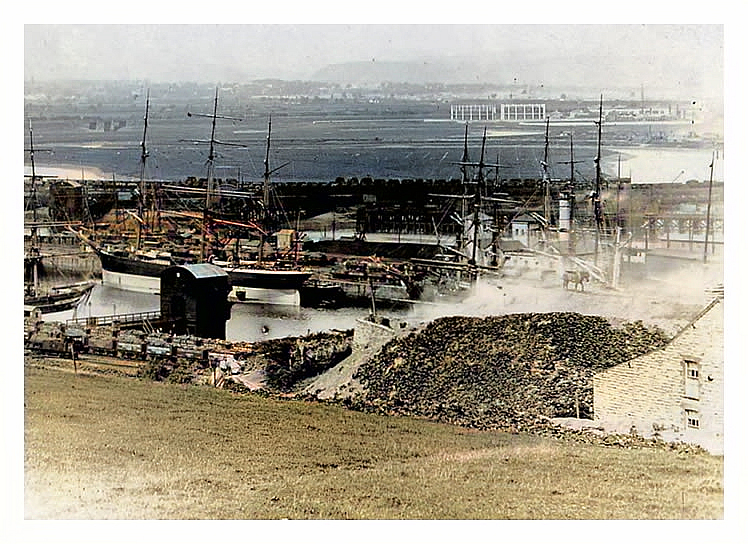 A panoramic view taken from the high ground, just below Dock Road, showing the limekiln and one of the three Limekiln Cottages (seen right). 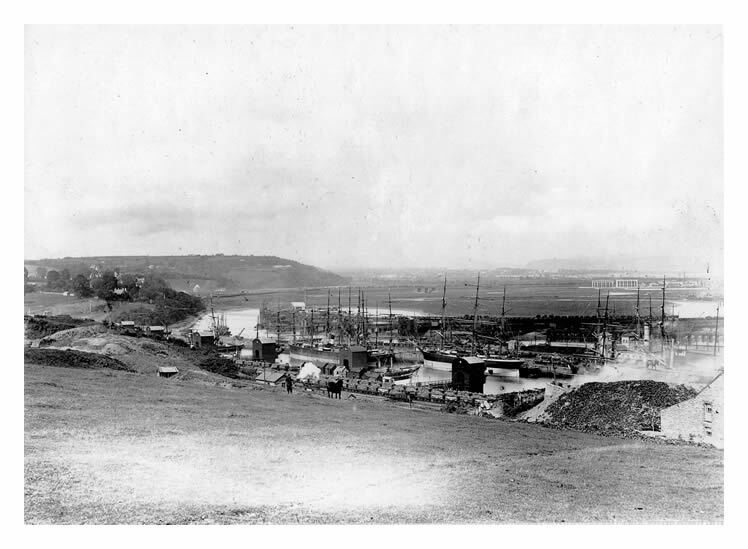 Coal tips, number 9 nearest, continue to the left in sequence 10 - 14 which dates this photograph after the dock extension of 1883. 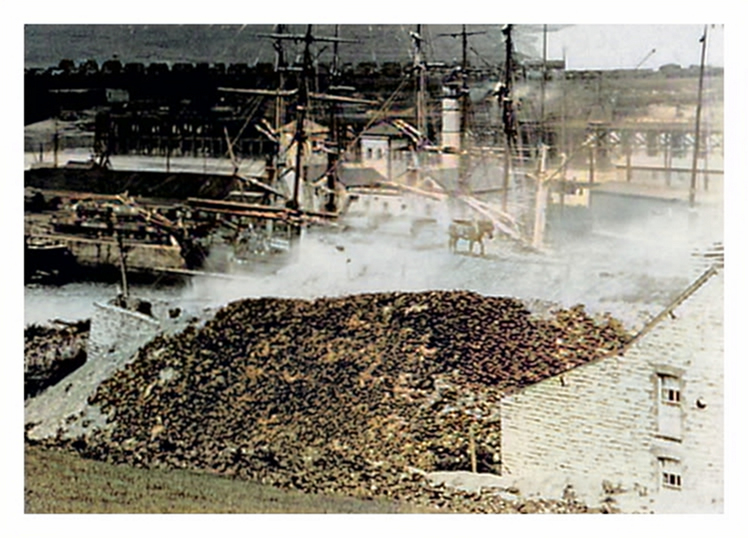 Over at the Ely Tidal Harbour, I note that the warehouse at the Victoria Wharf is missing ; having been destroyed by a massive fire during September 1888. (see Volume 06, Chapter 06 for more info on the fire) Cogan Junction signal box is to be seen to the left side of the upper image which was opened in 1889  so, I tentatively estimate the photograph to date from between 1889 and c.1891. Distant are two of the six gasometers of the Grangetown, or Grange Gas Works. A man with his horse, or pony, climbs the pathway which extends from Dock Road down to a subway passing under the permanent way to the dockside. A TVR steam engine is shunting coal trucks below and distant, another works away at the Llandough sidings. I can hear the distinctive clinking and clattering of the slack couplings as they take up their load ; and the hissing of steam ; the whistle of the steam engine ; the scraping of the wheel flanges against steel rails ; and then a knackered white metal truck wheel-bearing screams its merry tune! Oh, and then the ever present sulphurous odour mixed with steamy air and the River Ely ozone tickles your nostrils ; its all too much so you are forced to pick your nose again! Moored high in the water is a fine three-masted barque which awaits its turn at a tip for coaling. In the lower enlargement, a working horse appears to be levitating within the smoke of the limekiln stack. Closer examination reveals that it is actually walking precariously upon a high retaining wall probably dragging chains in order to turn the limestone to ensure even heating.